SHETLAND Islands Council is being asked to accept a draft Scottish budget that makes no provision for extra ferry funding that had been sought by the council. Tabling his first financial settlement report at a special full council on Wednesday, executive manager of finance Jamie Manson will propose councillors accept £5 million towards operational costs of inter-island ferries, which is nearly £3 million less than the £7.94 million the council wanted. The Scottish Government is priming the council for a 2.2 per cent drop in core funding – or £1.799 million – and a 2.3 per cent drop in capital – £156,000. According to council leader Steven Coutts the council will continue to lobby for the near eight million that is sought before the Scottish Government delivers its final budget in February. He said that islands minister Paul Wheelhouse had offered £10.5 million between Orkney and Shetland ferries in a meeting before Christmas. 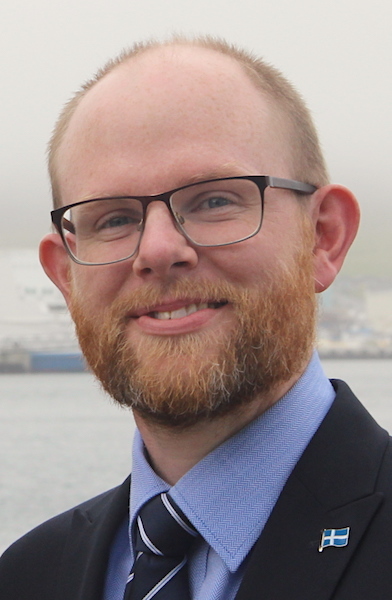 There was also a question of equity – with Shetland being the only local authority area expected to pay for part of its essential inter island ferry budget. He added that much more detail would emerge during the special council debate, where the budget is one of three items. SIC transport committee chairman Ryan Thomson said: “We asked for £7.9 million and that remains the ask, there is no question about it. “We have come to an agreement with Transport Scotland about that figure and there was no push-back from them. “The split of the £10.5 million [for the Northern Isles] has never been indicated but we fully expect £7.9 million because that is what we need for fair funding for our ferries. The ferry shortfall will go a long way to creating a gap in SIC finances, with services like education taking part of the hit, Thomson said. Manson’s report also warns the council will have to take tough decisions in future in the face of shrinking settlements from the government and warns of a potential £15 million gap in finances in four years time. Overall the council can expect a total of £94.729 million from the Scottish Government in 2019/20. This comprises £78.596 million in core revenue funding, £7.107 million in specific ring-fenced revenue grants and £9.026 million in general and specific capital grants. The report adds that for local authorities not accepting the settlement, a revised offer will be made. “The Cabinet Secretary has been clear that any revised offer will be ‘less favourable’, although no specific reference to the value of any such financial consequences has been provided,” it continues. The council’s funding package is lower than in 2018/19, but generally in line with expectations set out in the Medium Term Financial Plan and is therefore not unexpected, with the exception of fair funding for ferries, the reports adds. It says: “The settlement reinforces the scale of the challenge facing council, which is already facing an estimated funding gap of £15.6m by 2023/24. Coutts added: “It’s clear that the settlement being offered to local government is not unexpected, but its going to be a real challenge to continue to deliver the front line services the community needs. The package provides flexibility to increase council tax by up to three per cent. The council would receive an additional £281,000 in 2019/20 if an increase of three per cent were approved. The report outlines that the Scottish budget is not approved until it has been through three stages in the Scottish Parliament, with the final debate due to be heard on 21 February. It is understood that the Local Government Finance (Scotland) Order 2018 will be laid before Parliament by the start of February 2019 to meet the 20 February timescale.